With the turn-by-turn directions and traffic information, Google Maps has become an indispensable tool used by drivers to make sure that they arrive at the correct destination. And while Google Maps gives you information about your drive, including an estimated time of arrival, the app focuses on how you are getting to where you are going. It didn't tell you much about your destination. That is, until now. An update to Google Maps for Android is rolling out, and adds information about your destination, or any place that you look up. You will know the time and the current weather at the location where you are heading to. The latter is certainly important. If you are driving somewhere, it would be nice to know if you need an umbrella, or a sweater, when you exit the car. And Google Maps will also provide you with some fun facts about your destination. That could certainly give you some ammunition to help liven up a dull dinner or party. The update will also allow you to say "show traffic" or "hide traffic" if you want to see or remove such data from your screen. This way, you can have this information appear or disappear on a map without having to fumble with your phone while you are driving. Additionally, some strings were discovered that point to a couple of features that might not show up until a future update. For example, Google Maps will let you know how much time you can save by re-routing the navigation to your current destination. There also will be transit schedule alerts, giving you the word on early and late arriving trains and buses. 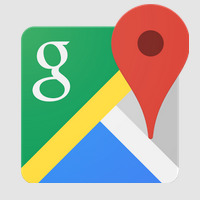 Google maps also bought out WAZE.com An ingenious app from the Israelis for android and iphone and tablets. It is free and gives you live interactive traffic conditions and safety information and much more. I use both Maps and Waze. Clever integration.